This patient Dr Bisanga placed approx 1800 FU via FUE into the crown area and recreated the natural “spiral”. The collage shows before, placement, grown out result and grown out with shorter shaved hair. Sorry, I should have mentioned, he had been on meds, finasteride, minox various strengths plus others for many years prior to surgery so what you see in the crown is the result of stabilised hair, there was never going to be any improvement from meds.He continues with meds now obviously to help prevent his crown opening further. A nice comparison, I like your results. Just a quick question about your FUE v. Strip, and also that in comparison to other clinics. What do you tell patients as far as regrowth time and yield? Do you see the same yield with both procedures, and how about the comparison in time for growth? I’ve been looking at Dr. Armani’s results, and it seems like his FUE might be taking longer to grow out than his strip procedures did, and also possibly not as well, in my opinion. What do you think about this timing/yield with your procedures and possibly in comparison to others? » prevent his crown opening further. » with both procedures, and how about the comparison in time for growth? » timing/yield with your procedures and possibly in comparison to others? Thank you for your comments, appreciated. In respect of yield we do not principally see any difference between the two techniques with our cases, and we do not compensate for potential lower yield when quoting graft numbers; for example when we advise we do not give a person two figures; strip lower graft number and FUE higher graft number because the yield maybe lower with FUE so having to compensate by placing more. So, in respect of yield we do not have a concern that they are dissimilar and as we perform the two techniques regularly with the same protocols and Med Team we have a fair amount of detail to make our assessment from. I think we have posted something like 10 grown out FUE results on this forum and I do not believe that judging them you would consider the results to be poor yield for the graft numbers used. In respect of growth rates, we have not found a significant difference between the two, the % of growth is about the same; but the calibre and quality of hair maybe slightly weaker initially with FUE and take a little longer to mature; this can be due to the healing or genetic bonding being slower because less fatty tissue surrounding the FUE graft, but even this we have not found a significant difference and it is more on an individual basis rather than across many cases. I cannot really comment on other results unless I have full knowledge of the case to base a judgment on, for example if you place 2000 grafts all single hairs even if you get 100% yield it will look like a poor result for that amount of grafts opposed to the same graft numbers but made up of multiple hair FU’s. There is clearly a difference if you take a look at Hasson and Wong (strip only )'s patients and compare to FUE results with the same # of grafts. I can’t explain but Hasson and Wong almost always give better yield. » can’t explain but Hasson and Wong almost always give better yield. It is next to impossible to compare results. There are too many variables that make it virtually impossible to have the same unique situation. There is only one exception I can think of : identical twins. I am personally conviced that if you where to perform HT on identcal twins using strip on 1 person and FUE on the other person the endresult would look the same in the end if both where executed by highly trained drs. ps : Great result shown by bhr ! » » only )'s patients and compare to FUE results with the same # of grafts. » » can’t explain but Hasson and Wong almost always give better yield. » that make it virtually impossible to have the same unique situation. » There is only one exception I can think of : identical twins. » look the same in the end if both where executed by highly trained drs. » ps : Great result shown by bhr ! Also as I said, happy to judge any of the FUE I’ve posted here verses numbers and yield; but to move on a little about this case because crown work is not often seen. As the crown can open on all sides it is important to look at the persons age and patterning before deciding if it is a good idea or not, a crown can sometimes measure the same as the frontal 2/3rds in surface and this can require more grafts than the donor can allow, so it is always important to judge when crown work maybe a good idea. In this case the patient is in his early 40’s and had been using meds for years and continues to do so. 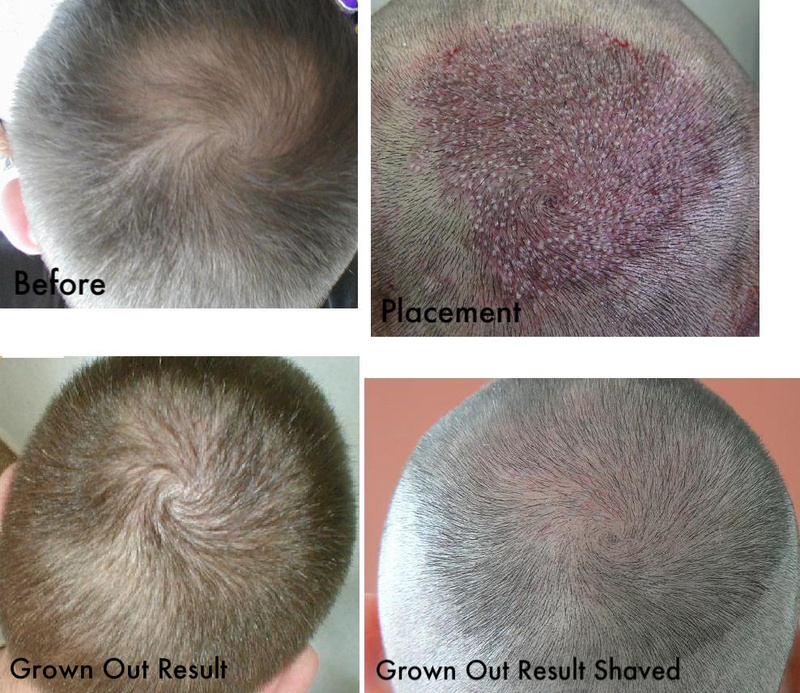 A hair transplant in the crown is very different from the frontal area; an obvious difference is the creation of the swirl or spiral with the hair coming from a central point out. This in itself is artistically difficult to achieve when making the slits and then there the density and the distribution of hair over a deceiving large area whilst preserving the donor. Because the lay of the hair is different from the frontal areas the illusion of thickness is harder to achieve. This is due to the hairs almost lying in concentric circles and less over each other until the crown blends with the surrounding hair. Each hair in the frontal overlaps the other better hence blocking the light better; so the skill with the crown is to place a relatively small amount whilst create the spiral look and enough thickness, and in this case even with very short hair the patterning of the crown is not only present, the blend with the existing hair is seamless and for the number of grafts a good surface area covered. Very natural looking. Good Work. Nice to get your opinion of fue yeild and growth rate versus strip also. » Very natural looking. Good Work. » Nice to get your opinion of fue yeild and growth rate versus strip also. I agree, very nice, just like what he was born with, it looks natural even when it was shaved down to the bone.